Prominently shows the volcanic island of Krakatoa, which famously exploded killing nearly 35,0000 people in 1883 - and which may explode again with even more disastrous results. 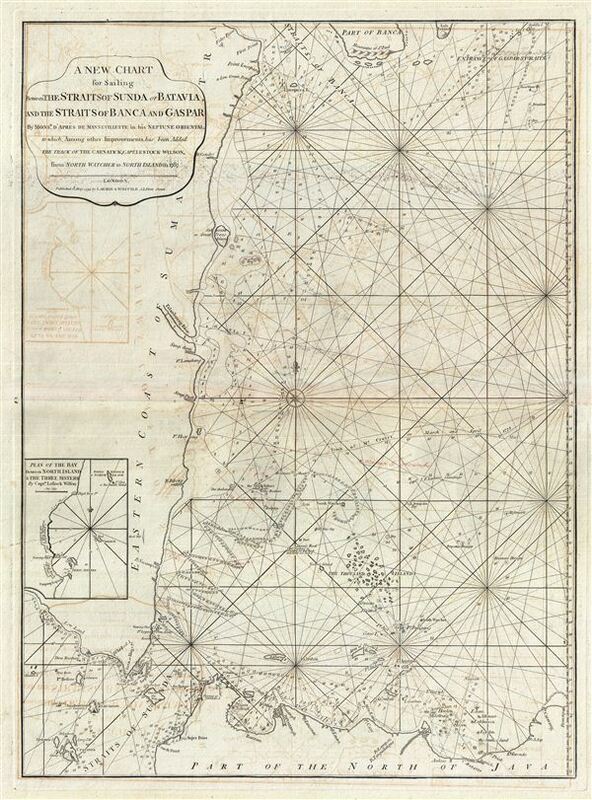 A New Chart for Sailing between the Straits of Sunda or Batavia and the Strairs of Banca and Gaspar. This is a fine example of Laurie and Whittle's 1794 nautical chart or maritime map of northwestern Java and eastern Sumatra, including the Straits of Sunda and the Strait of Banca. The map covers from the Strait of Banca southwards to Krakatoa (Cracatoa), the east as far as Batavia (Jakarta). Throughout the 17th and 18th centuries, this region was a major battleground between rival Dutch, British, and Portugese trading monopolies. The Dutch and British in particular contested over northwestern Java, with its easy access to regional spice, in particular pepper, ports. In 1602 the British East India Company established a trade entrepot at Bantam to contest Dutch East India Company (VOC) control based in nearby Batavia. The Dutch, allied with a local Sultan, eventually drove the English out Bantam and Java itself. By the end of the 18th century, when this map was made, the Bantam entrepot was little more than a name on a map - as seen here - while Batavia further east had risen, with a population of nearly one million, to dominate Java. In 1800, just six years after this map was published, the VOC was formally dissolved and the Dutch East Indies established in its place as a full-fledged national colonial venture. The British meanwhile established themselves in Bencoolen, on Sumatra, and later in Singapore and Malacca. The region took on additional significance early in 1794, just before this highly detailed map was issued. Though continually at odds, the Dutch and English, in January of 1794 temporarily set aside their differences to battle piracy in the Sunda Strait Campaign. The Sunda Strait Campaign is officially considered an extension of French Revolutionary Wars in which French naval vessels operating out of Mauritius, abandoned by their government, turned to piracy and privateering, preying on English and Dutch vessels plying the narrow and vital Straits of Sunda. The French pirates disrupted trade in the region to such an extent that the Dutch and English formed a temporary alliance, presenting a united front and defeating the French pirates in the Battle of Sunda Strait. Ultimately the British took control of Maruitius and both the WIC and VOC actively discouraged subsequent piracy in the strait. This map is also of interest for its detailed depiction of Krakatoa (Cracatoa), the volcanic island in the Straits of Sunda that famously erupted in 1883, obliterating the island and killing nearly 35,000 people. Today, constant volcanic activity has reformed the island, now called Anak Karakatoa or Child of Krakatoa. There is a very serious possibility that the island will once again explode. If this ever happens the catastrophe of 1883 will seem mild in comparison. Laurie and Whittle prepared this chart for their 1799 issue of the East-India Pilot. Cartographically this chart is derived from earlier maps prepared for Jean-Baptiste d'Apres de Mannevillette's 1745 Neptune Oriental. It was subsequently updated and revised under Laurie and Whittle based on charts compiled by Captain Lestock Williams. The map offers rich detail including countless depth soundings, notes on the sea floor, commentary on reefs, rhumb lines, shoals, place names and a wealth of other practical information for the mariner. This map was registered by Laurie and Whittle from their offices at 53 Fleet Street, London, on May 12, 1794.